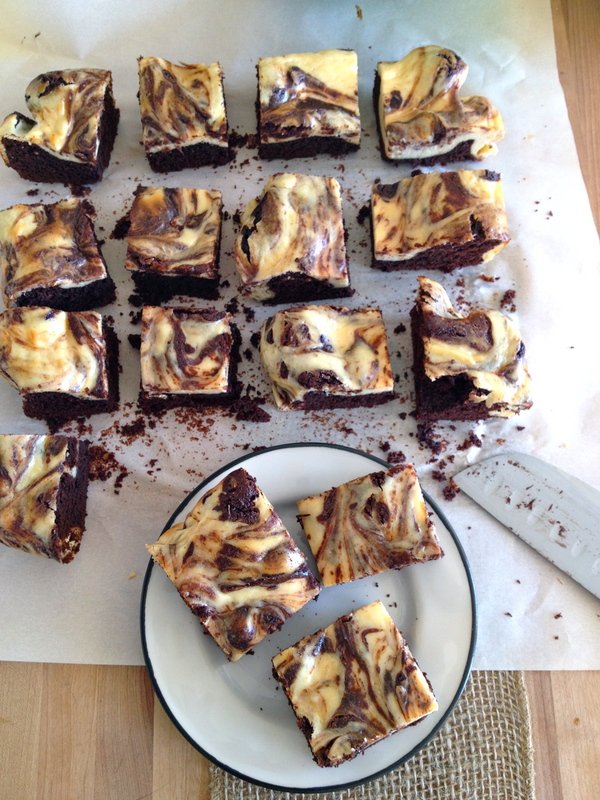 I pin and bookmark a lot of recipes that involve marbling, because I think that swirly mingling of colors is just so loose and free and pretty. This particular recipe has been on my list for at least three years. “On my list” is what I say about literally anything that I want to try eventually but have no real motivation to try right now. Mostly I use it about recipes, books, and TV shows. There is no time constraint for how long something can be “on the list;” case in point: it took me three friggin’ years to try this recipe. And someday I’ll watch 24 and read William Faulkner, but I have no plan to do either of those right at this moment.But wow am I glad I finally got down to business with this recipe, because it’s easy and tasty and fancy, all at the same time. I brought a batch to a Memorial Day barbecue, and while there was also an offering of special brownies at the party, mine more than held their own. What they lack in the party enhancement department, they make up for with major tasty goodness. Score one for cheesecake!! 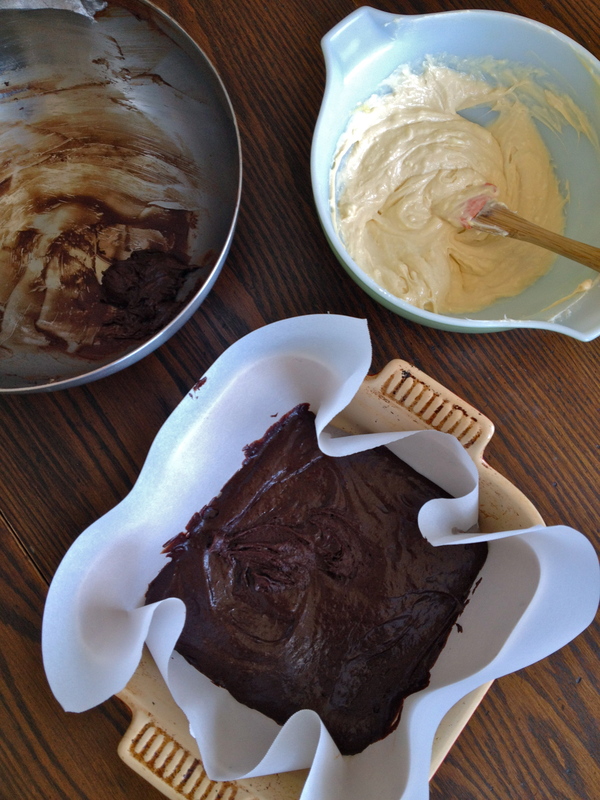 To make the brownie layer, use a double-boiler to melt the butter and chocolate chips together, stirring until smooth. Remove from heat and mix in brown sugar and vanilla. Let cool slightly before stirring in one egg at a time. Sift in the cocoa powder, coconut flour, potato starch, baking soda, and salt, and stir into chocolate mixture. Line an 8×8 baking dish with parchment paper and pour in all the batter except 4-6 tbsp (we’ll swirl this portion into the cheesecake). Set aside. To make the cheesecake layer, put the cream cheese in a mixing bowl and beat with a spoon until smooth. Mix in the sugar and vanilla, and then stir in the egg. The mixture will look curdled, but continue to stir gently until the egg is worked in and the mixture is smooth. 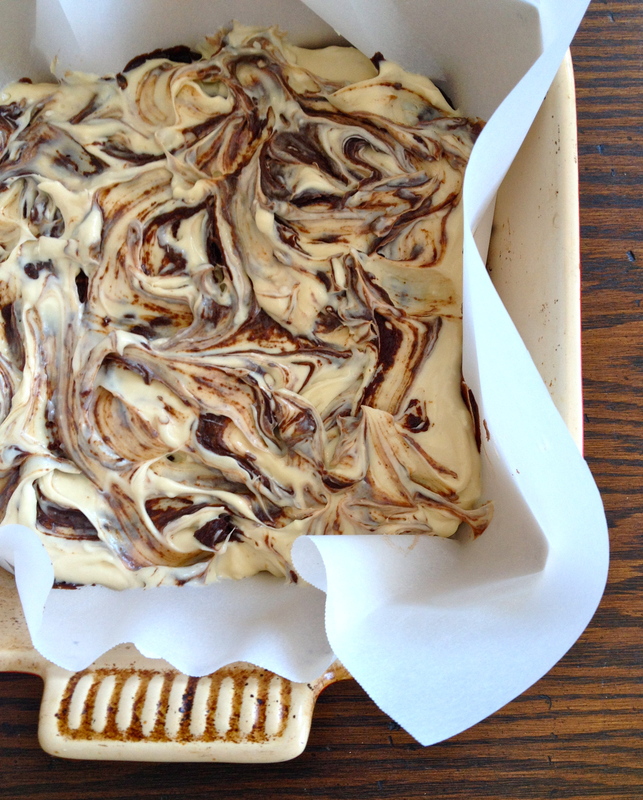 Pour the cheesecake mixture over the brownie batter and carefully spread it into an even layer. 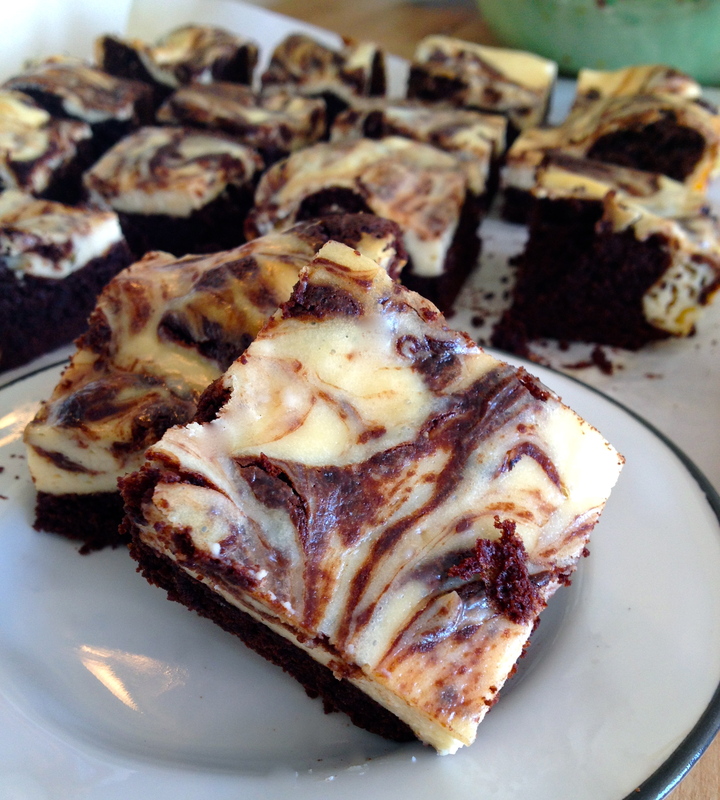 Drop the remaining brownie batter in a line down the middle of the cheesecake. To marble the top, use a knife or toothpick to drag the chocolate part up through the cheesecake, making whatever marbling shape you like (or just marble at random). Cool at least an hour before cutting the brownies. I actually recommend keeping them in the fridge at all times. Serving them cold just makes such a difference – the consistency is creamy and almost fudge-like, and the chilly cheesecake is perfection! 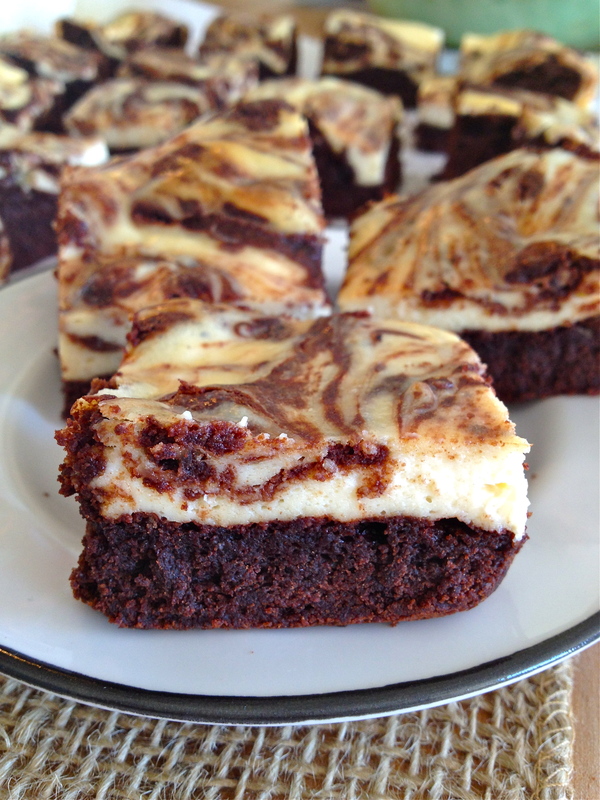 Previous Toasted Marshmallow Coffee Brownies. Next Strawberry “Nutri-grain” Snack Bars. 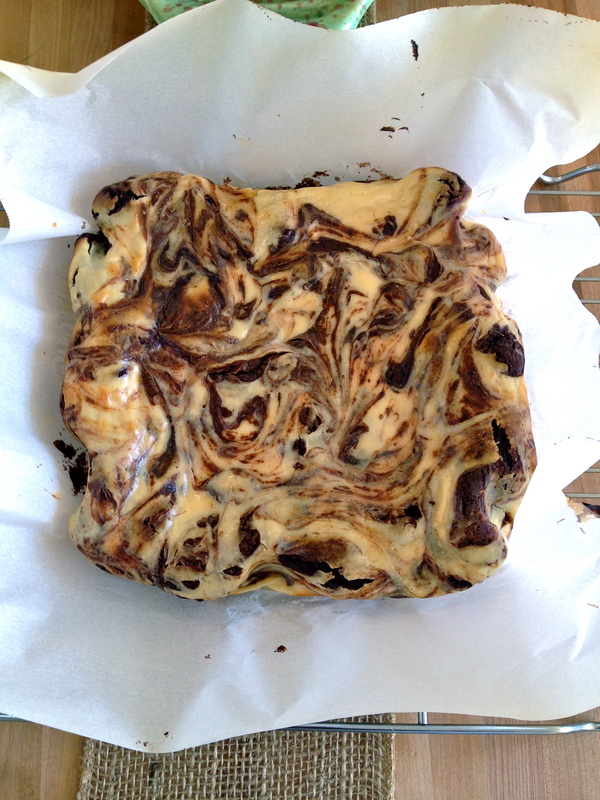 I have never tried marbling before…gorgeous!